← Give me an “A”! No, make it an “E”! 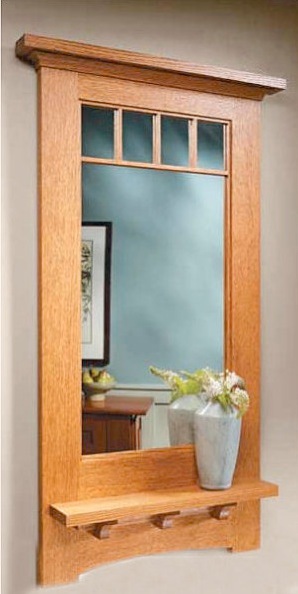 While watching a decent woodworking TV show, WoodSmith Shop, I was interested in the Craftsman-Style Mirror they had featured on a recent show. Christmas was coming, and the mother-in-law needed a gift, so, I thought this would be a good one. The show detailed how to make the trickier parts of the project (thought it was a simple project), and they were giving away the plans free! Get them here. So what went right, and what went wrong? What scared me the most was making the cove molding, which sits under the shelf. They wanted me to use the angled table saw trick, which, admittedly, concerns me, putting side pressure on a blade. Just doesn’t sit well with me. Instead, I used a large Core Box router bit, taking several passes, and it came out beautifully. The crown molding under the cap was a bit tricky, but I was never good at crown molding to begin with. Nevertheless, it adds a wonderful touch. The small, 1/4″ muntins were delicate, and a bit tricky to make, but also add a great deal to the piece, breaking up the large glass surface. I used quarter-sawn white oak, but they used plain sawn white or red oak. That is their picture you see here. The tricky part was the mirror; they don’t tell you how to procure one in the plans. I went to a glass dealer and he cut me a nice 1/8″ piece, not bevelled, and not side polished, for only $25. I used a special hanging bracket they highlighted in the show, which is well worth the $8 at Woodcraft. This is a hefty piece, probably about 15 pounds, so a good mounting is essential. If you’re looking for a nice weekend project that will please the woman in your life, this might be it. In total, the project was about $50….well worth it. It was well received by the mother-in-law.